In the illustrations below I am going to use 300 yards and dye them in multi-colors. If you plan on dying a large lot for a big project and want all your yarn to come out the same, you can felt the ends together before you start. I use my kitchen sink for the next step, fill the sink up with enough tap water to cover the yarn and add 1/2 cup of vinegar and mix it well and add your yarn and make sure it is completely covered, I let mine soak for about 15 minutes. 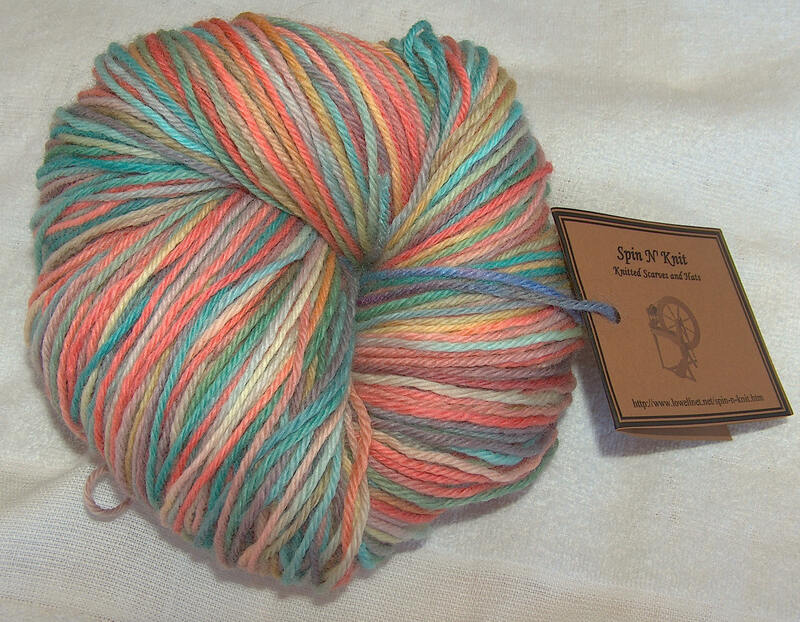 You will need a large surface to color your yarn. I would recommend a well protect table outside or even a large piece of plywood will do. I am going to use my patio table and protected with plastic and old towels. 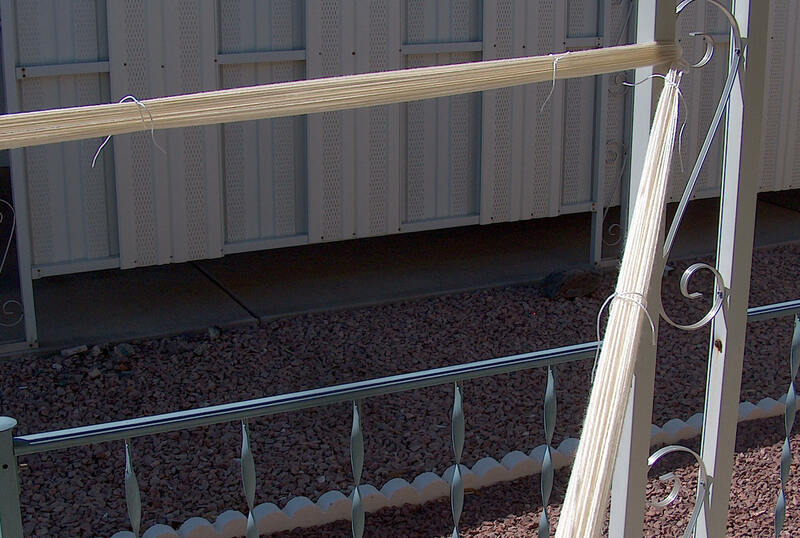 After your yarn has soaked ring it out good and lay your yarn on the surface you are going to use. 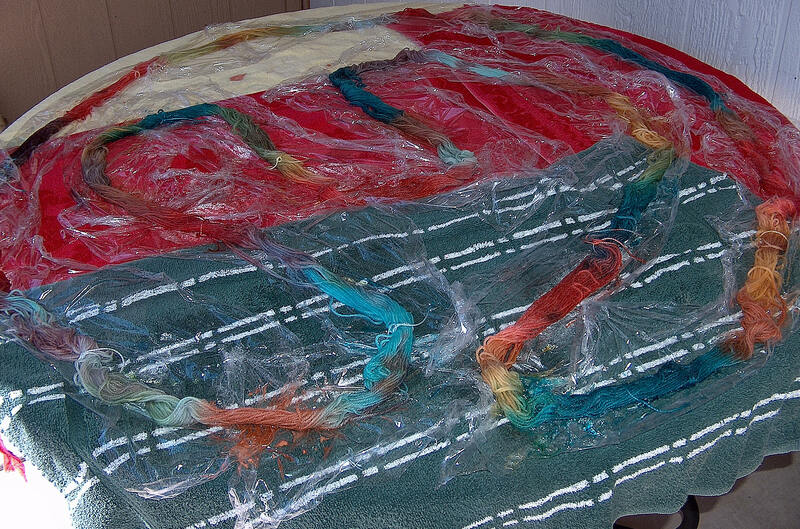 Lay Cellophane wrap under each part of the yarn so you can wrap each run of the yarn in it when you are done coloring. Place 2/3 cup hot water in the Dixie Cup add 1 TSP Vinegar. Stir and the add your Dye or Kool-Aid a small amount at a time till you have the color you want. Then brush it on your yarn, when you have the area painted you want, turn the section over and paint that size, make sure you soak it good in color. You can experiment and combined different colors together to see what you get. 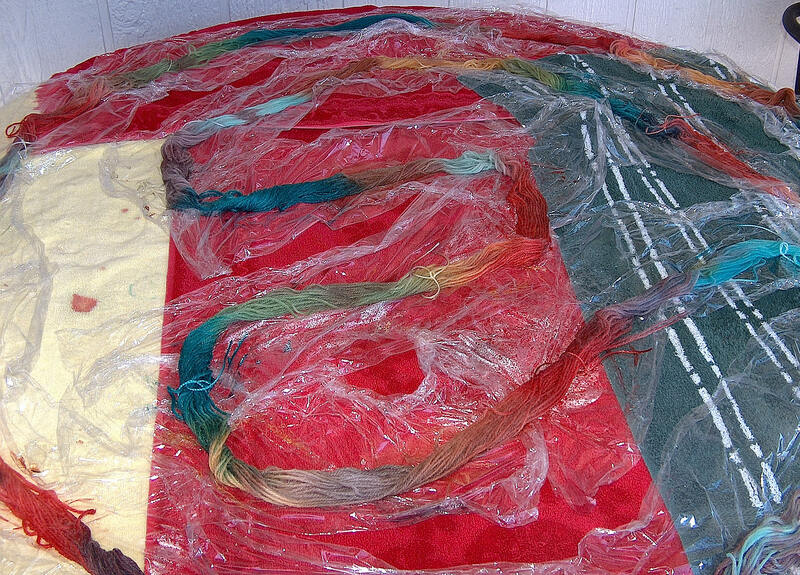 Then wrap up all the runs of yarn in the cellophane you put down under the yarn and place the yarn in a microwave for 5 minutes. Turn over and give the yarn another 2-3 minutes .